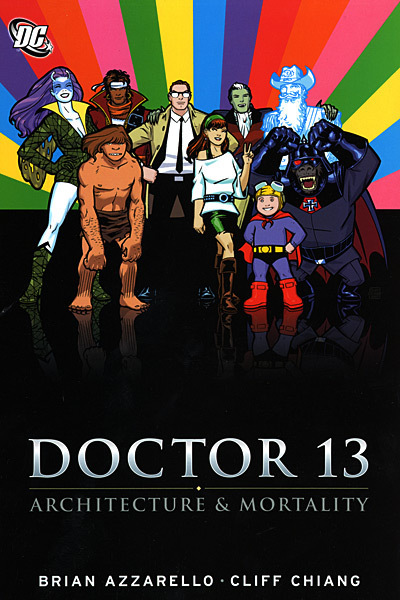 Doctor 13 is an old DC character from the 60’s that doesn’t make a lot of sense in a world full of superhumans, magicians, and god-like entities: He’s a skeptic. Now, I consider myself to be an amateur skeptic of sorts; in that the only way I would believe in people with super-powers, is if one of them flew down to my house and crapped on my new carpet. So you can see why I would identify with him. But how can you be a skeptic in a world full of magic? When the evidence of the existence of the paranormal slaps you in the face every single day? That’s what Brian Azzarello and Cliff Chiang try to answer here. This is honestly one of the weirdest things DC has published in recent memory, and I love it. Brian Azzarello is usually known for his hardboiled crime fiction, but he turns in a fun, completely absurdist piece here that isn’t like anything he’s ever done. Cliff Chiang is one of the very few modern day pencillers whose work is strong enough to get me to buy a book just for the art, and he outdoes himself here. I will definitely say that this isn’t for everybody (a good friend of mine looked at a few pages of this book and said that it was the most ridiculous piece of comic book art he’s ever seen. And he likes Frank Miller), but if the idea of talking Nazi Gorillas teaming up with gay vampires and 30th Century plague carriers to convince Geoff Johns and Grant Morrison not to write them out of continuity sounds like your bag, give this a shot. It’s pure, absurdist comic book fun. Also should mention that this has one of the best last pages to a comic story that I can remember. Flash And Green Lantern – Brave And Bold. Whew! Finally some characters you’ve heard of. These two are familiar to pretty much everybody, and for good reason. 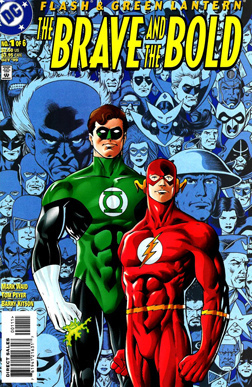 They’re 2 of DC’s ‘Big 5″ characters, although you wouldn’t know it by the way DC treats them sometimes. This is a flashback story, delving into the early friendship between Barry (the original Silver Age Flash, then was killed by the Anti-Monitor. Then Wally West who used to be Kid-Flash became Flash, and at first everyone hated him but then Mark Waid wrote him and people started to like him, but then for some reason they made Impulse the new Flash. He’s actually Barry Allen’s grandson from the far future, but then he died, and now for some reason Barry Allen is back even though Wally West is a more interesting character but for some reason DC seems to think that the best way to deal with poor sales is just by rebooting everything back to 1975) Allen and Hal (was the original Silver Age Green Lantern, but then went evil and killed a lot of people and then he died, but then came back to life, and then died again. And then he became God’s Spirit Of Vengeance, which is an ok gig if you’re retired I guess, but then he came back to life yet again, and now he’s back to being Green Lantern again) Jordan. Yes. This was nicely written. Mark Waid goes back into the Silver Age era he knows so well, but adds nuance and breadth to these characters that never really existed before now. In fact, a lot of what Waid did here set the groundwork for the inevitable resurrections of each character, and some of the characterization here can be found in both the current Flash & Green Lantern titles. Tom Peyer’s pencils work well with the story, and it’s overall a good read, though not essential. Please also note that despite my sizable DC collection, this is the ONLY trade I own with the Flash’s name in the title. I’ve never been a big fan of the character, though I will most likely give the rumoured omnibus of Geoff Johns run on the book a try when it comes out next year. The commercial reaction to Gotham Central when it was on the stands sums up everything that I think is wrong with modern comic book fans: It’s extremely well-written, with complex characters and exciting action-packed scenarios. When it was being produced, it was regularly one of the most critically acclaimed series on the stands, and I can say without exaggeration that this is one of my favourite DC titles of the past decade. And nobody read it. It’s an idea so simple you can’t believe it hasn’t been done before: What would it like to be a police officer in a world full of superheroes? I should also mention that it HAS been done before, notably with Brian Bendis and Mike Oeming’s brilliant Powers series. But this was the first time it had been done with heroes we know. What would it be like to work 6 months on a case and then have a 14-year-old in tight shorts come in and beat all of your suspects up in one night? Or to have a sociopath in a bat costume have more credibility with the citizens you’ve sworn to protect than you do? That’s what Gotham Central is about. It’s the story of Gotham City’s Major Crime Unit: A group of detectives hand-picked by Commissioner Gordon to take on the city’s worst problems. It was originally co-written by two of my favourite contemporary writers: Greg Rucka and Ed Brubaker. There were different artists, though Michael Lark was the initial and primary penciller on the book. I consider this book to be a gateway drug. If you only read superhero comics, but want to get an accessible look at what else is out there, try this book. If you’ve never read superhero comics, but want to see what it’s all about without having your intelligence insulted, try this book. 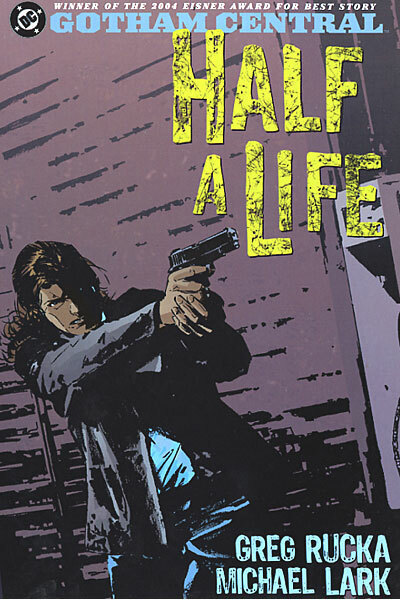 It’s like Law And Order, if L&O had occasional cameos by Batman, but was also not boring.. I’ll also say that I would consider Half A Life (the second major arc of the comic) to be one of the finest story arcs to ever be found in a DC comic book. Next up: Some characters YOU ACTUALLY HAVE HEARD OF!!!! GREEN ARROW! GREEN LANTERN! HAWKMAN! Well, 2 out of 3 ain’t bad. Oh, and the culling starts in earnest…. This entry was posted in Comic Books and tagged Batman, Brian Azzarello, Cliff Chiang, Comics, DC, Doctor 13, Ed Brubaker, Flash, Gotham Central, Green Lantern, Greg Rucka, Mark Waid, Tom Peyer. Bookmark the permalink. Don’t encourage people to crap on the new carpet. Not just any people, superpeople. They live by different rules than we do, so there’s really nothing we can do.